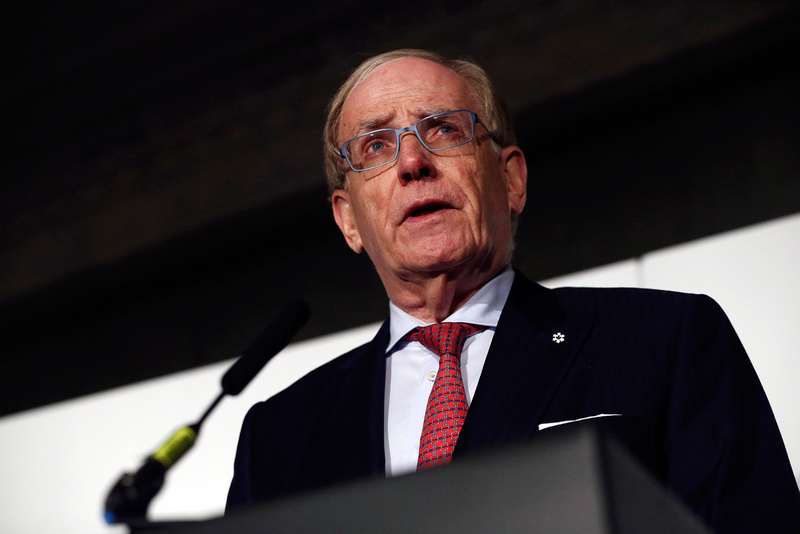 Lawyer Richard McLaren delivers his second and final part of a report for the World Anti-Doping Agency (WADA), at a news conference in London, Britain. In a more detailed version of the report released in July, the head of the independent WADA commission has announced that the international doping scandal implicates over 1,000 Russian athletes, and has repeated accusations of state involvement. The publication of the long-awaited second part of the McLaren report into doping in international athletics has seen Russian sports hit the headlines for all the wrong reasons once again, with the investigator saying that the findings show international sport has been "unknowingly hijacked by the Russians” for years. Presented on Dec. 9 in London, the report, prepared by the WADA independent commission headed by Canadian lawyer Richard McLaren, contains some truly staggering figures. According to the findings of the commission, between 2012 and 2014, over 1,000 Russian athletes were involved in manipulation of positive samples. Furthermore, the report asserts, they were acting not single-handedly but with the support of Russian officials and secret services, reiterating the earlier accusation that Russia had been running a state-sponsored program to cover up doping. Samples were allegedly swapped starting from the 2012 London Olympics at all major tournaments, including the 2013 World Athletics Championship in Moscow. Violations were found during the 2014 Winter Olympics in Sochi too: The WADA commission, according to McLaren, found that 95 of the sample bottles collected from Russian athletes at the Sochi Olympics had been tampered with, and 21 sample bottles with marks and scratches from the 2014 Paralympic Games. In London, McLaren laid out in detail the conclusions reached in the first part of his report, which was published on July 18 in Toronto. It was then that he first announced that during the Sochi Olympics the Russian Sports Ministry, with support of the secret services, had systematically swapped dirty urine samples for clean ones. McLaren's independent commission arrived at that conclusion on the basis of examining 11 Russian samples that were stored in Lausanne. On all those sample bottles, WADA officers found signs that they had been tampered with. McLaren based his first report on the facts that had been made public by the former head of the Moscow anti-doping agency, Grigory Rodchenkov, in an interview he gave to The New York Times in May. It was several days after the publication of that interview that WADA set up a group to investigate Russia's alleged doping violations and appointed McLaren to head it. After McLaren presented part one of his report, WADA called for Russia to be banned from the Rio Olympics. The International Olympic Committee, however, decided not to resort to such extreme measures. Similar criticism was made of part two of McLaren's report. "There is no evidence" – was the most common phrase used by Russian politicians and sports officials in the first hours after the presentation of McLaren's report, ignoring the tampered bottles and the testimony of Rodchenkov. "In his speech, McLaren did not say anything new about doping in Russia. He speaks of 'thousands of athletes', of some letters and witnesses," head of the State Duma committee for physical culture and sport Mikhail Degtyarev wrote on Twitter. Russia's irritation is understandable given that Moscow hoped that this time round McLaren would not be quite as harsh as in the first report. All the more so since in the four months since the publication of the first part of the report a lot has been done to save the reputation of Russian sport. The anti-crisis measures were carried out by a dedicated anti-doping commission headed by an honorary IOC member from Russia, 81-year-old Vitaly Smirnov. It has successfully lobbied for making inducement to doping a criminal offense in Russia and removing the Sports Ministry from the list of the founders of the Russian Anti-Doping Agency, RUSADA. Not long before the presentation of McLaren's report in London, Vitaly Smirnov, who is considered to be the most respected and influential sports officials in Russia, said that McLaren was satisfied with the work being carried out by the Russians. "This year, Russia has started to reformat its anti-doping system. It is stupid if somebody does not want to notice our steps," said Sergei Kushchenko, a representative of the anti-doping commission. For his part, McLaren assured journalists that all the conclusions made in his report were based on material evidence rather than oral testimony. At the same time, he did not disclose the names of those implicated in doping, saying that all the information had been handed over to WADA and the relevant sports federations. In addition, WADA has launched a website where one can study the independent commission's findings. Athletes' names there have been replaced with digital codes.